Elite Stat: Joe Flacco had an adjusted completion percentage of 86.7 percent this week. Joe Flacco had by far his best game of the season against the Detroit Lions, looking like the quarterback that led the Ravens to the Super Bowl for the first time in years. Flacco made very few errors in the game, and was kept clean for all but seven dropbacks, completing 72.4 percent of his passes from a clean pocket and racking up a passer rating of 120.0 on those attempts. If the Ravens could get this Flacco down the stretch they will become a formidable force in the AFC’s playoff push. Elite Stat: Kenyan Drake broke seven tackles on 26 total touches against the Broncos. Miami has been coming to terms with life without Jay Ajayi, and at least in this game, Kenyan Drake made them forget about Ajayi entirely. Drake carried the ball 23 times, racking up 120 yards thanks to seven broken tackles on those carries. He added three receptions for 21 yards as a receiver out of the backfield. Drake was a force in this game and gave the Dolphins the production they needed to overcome Denver. Elite Stat: Jermaine Kearse gained 4.03 yards per route run this week. Jermaine Kearse’s sideline catch was a thing of beauty, but it wasn’t the only play he made against the Kansas City Chiefs and in particular Steven Nelson. Five of Kearse’s nine catches came against Nelson, and 129 of his 157 yards. All in all, Kearse caught all nine of the passes thrown his way, gaining 80 yards after the catch. Elite Stat: Robby Anderson gained 2.93 yards per route run this week. Joining his teammate on the team of the week is Robby Anderson, who continues his stellar run of form for the Jets. Anderson actually saw more targets (12) in this game than Kearse did, even if he finished with one fewer catch (eight). His eight receptions went for 107 yards and he beat Marcus Peters for two of those catches. Anderson also caught two passes against former Jets great Darrelle Revis. Elite Stat: Delanie Walker gained 3.0 yards per route run this week. One of the best tight ends in the game had another excellent game this past week against a division foe in the Houston Texans. Walker is Marcus Mariota’s favorite target, and games like this prove why. He had one fewer target than WR Eric Decker, but he caught all five of the passes thrown his way, and unlike some other receiving threats at the position, graded well as a run blocker, helping to pave the way for Tennessee’s powerful backs. Elite Stat: Hunter Henry gained 2.15 yards per route run this week. Chargers TE Hunter Henry had a great game against the Browns in what was a battle of the tight ends as it turned out, with Cleveland rookie David Njoku also having a big day. Henry caught seven of the eight passes thrown his way, racking up 81 yards in the air, and giving Philip Rivers a passer rating of 108.9 when throwing his way. Like Walker, he also had an impressive run-block grade into the bargain. Elite Stat: Joe Staley allowed zero total pressures this week. The Chicago Bears have been struggling to generate pressure on the edge all season, and Joe Staley was able to take advantage of that for one of the best games of his season. He had a perfect day in pass protection, keeping new quarterback Jimmy Garoppolo clean on all 40 of his pass-blocking snaps. Staley at his best is also a powerful run blocker too, and graded well against Chicago’s formidable defensive front in that aspect. Elite Stat: Joel Bitonio allowed no pressures across 37 pass-blocking snaps. Joel Bitonio has been the best player on the Cleveland Browns offensive line with Joe Thomas done for the season, and is currently enjoying the best season of his career. 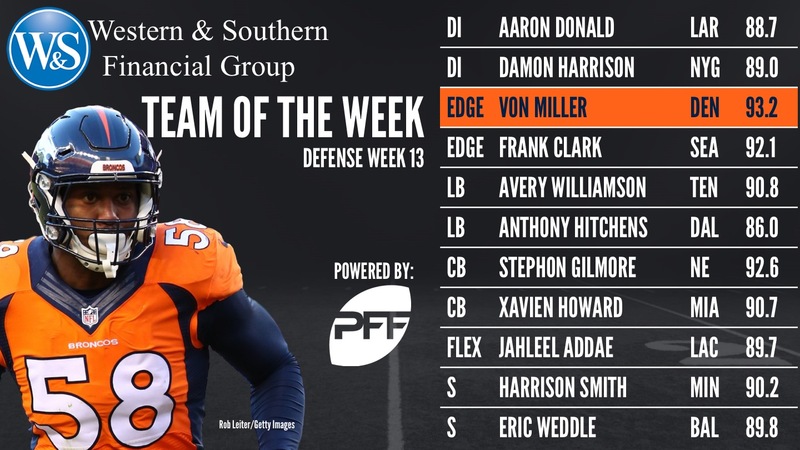 He has made PFF’s team of the week a couple of times already, and against the Chargers he didn’t allow a single pressure across the entire game, while grading well in the run game. Elite Stat: Mike Person allowed zero total pressures from 41 pass-blocking snaps. Making his first start of the season for the Indianapolis Colts at center, Mike Person had a fantastic game. He didn’t allow a single pressure against what has been a wrecking ball of pressure in the shape of the Jacksonville defensive front, and he also got the better of them in the run game where he earned a solid grade. The only black mark against him was being flagged for being down field on a pass play, but the screen was delayed so even that negative wasn’t Person’s fault. Elite Stat: Josh Sitton allowed no pressures from 20 pass-blocking snaps. Josh Sitton is the league’s best pass-blocking guard when he is on his game, and he was in full force against the San Francisco 49ers this past week. He didn’t allow a pressure across 20 pass-blocking snaps, albeit a very low number for an offense that has yet to take the training wheels off rookie QB Mitchell Trubisky. Sitton also graded well in the run game even as the Bears offense overall struggled. Elite Stat: Daryl Williams allowed zero total pressures this week. Playing well against sub-par opposition is one thing, but having an excellent game against one of the toughest assignments on your schedule is another entirely. Daryl Williams was excellent at right tackle for the Carolina Panthers this week despite seeing Cameron Jordan lined up across from him at times. Williams didn’t allow any pressures across his 36 pass-blocking snaps and it was just the second time all season that Jordan has failed to either sack or hit the quarterback, tying for his lowest pressure total of the year. Elite Stat: Aaron Donald had eight total pressures this week. 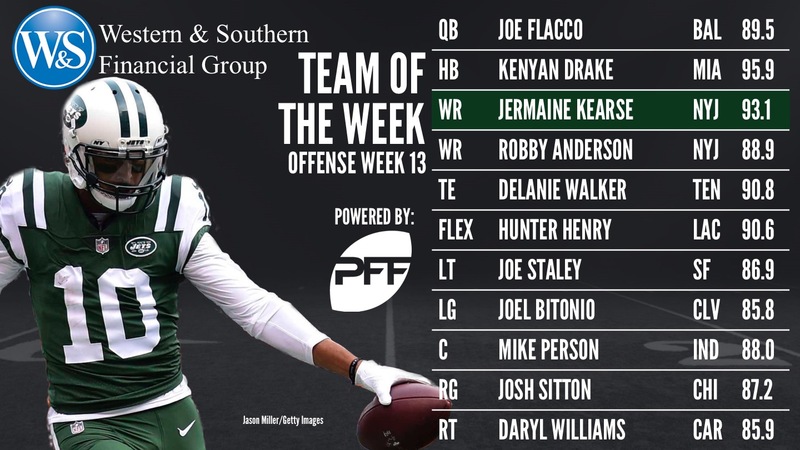 After a break last week, Aaron Donald returns to his spot on PFF’s Team of the Week after an impressive display against the Cardinals. Donald had a pair of sacks and six additional hurries, as he was able to knife through the Cardinals line seemingly at will. He was less successful against the run however, as the team was clearly trying to use his quickness and penetration against him by allowing him up-field and utilizing the space behind him. Elite Stat: Damon Harrison had a run stop percentage of 17.4 against the Raiders. Watching Damon Harrison defend the run on tape is something else entirely. He is unlike any other defensive linemen in terms of the strength he has and ability to rag doll offensive linemen trying to block him. He impacts nearly every single run play, and once again had a dominant grade in that aspect against the Raiders, who may have the most powerful offensive line in the league in brute force terms. Harrison led the team with four defensive stops from his nose tackle spot. Elite Stat: Von Miller had nine total pressures against the Dolphins. Denver’s defense may be struggling compared to what we saw from it earlier in the year, but Von Miller put together one of the best games of his season even if he was unable to register a sack. Miller posted two hits and seven hurries against the Miami offense in 34 pass-rushing snaps, and led the team with five defensive stops in the run game. Miller was the best player on defense for the Broncos in this game, and looked every bit an All-Pro edge defender. Elite Stat: Frank Clark had seven total pressures from 38 pass-rushing snaps. While the Eagles defensive front going up against the Seahawks offensive line looked like the big mismatch on paper heading into this game, it was the dominance of Frank Clark in particular against their offensive line that was a far bigger key to this game. Clark had two sacks, one hit and four hurries of Carson Wentz, notching three defensive stops in the game. He was consistently applying pressure and playing the game on the Eagles side of the line of scrimmage. Elite Stat: Avery Williamson allowed just 12 yards in coverage against the Texans. While the linebackers on this team a week ago were the best two linebackers in football, two rather less-heralded names take their spot this week. Against the Texans, Avery Williamson was a force in the run game, consistently beating Texans linemen at the second level and forcing the runner to cut or squeezing the point of attack. Williamson made three defensive stops in the game, and also graded well in coverage. Elite Stat: Anthony Hitchens allowed 42 yards in coverage against Washington. Back on Thursday night, Anthony Hitchens was in fine form as the Cowboys continue to deal with life without Sean Lee on defense. Hitchens led the team in solo tackles with 11, more than twice the figure of the next best player, and also had five defensive stops, again the best mark from any Dallas Cowboy. His best plays were all in the run game, and only a single missed tackle marred his overall performance. Elite Stat: Stephone Gilmore allowed just two catches for 22 yards when targeted this past week. Over the past two weeks, Stephone Gilmore has been the dominant force at cornerback the Patriots thought they were getting when they paid him big money in the offseason. Against his old team, he was thrown at five times, all while covering rookie Zay Jones, and gave up just two catches for 22 yards. He also broke up two of the incompletions, and was a big reason Tyrod Taylor and company could get nothing going in the passing game. Elite Stat: Xavien Howard allowed a passer rating of just 1.4 when targeted against the Broncos. Miami’s coverage this season has blown hot and cold, but this was the best game of Xavien Howard’s career. Covering Demaryius Thomas for the most part, Howard was phenomenally productive when targeted. He was thrown at nine times overall, allowing just two catches – the same as the number of passes he himself caught for interceptions – while breaking up another three of the incompletions. Elite Stat: Harrison Smith a run stop percentage of 16.7, third among qualifying safeties. Harrison Smith was the best player on a Minnesota defense that did an excellent job limiting a powerful and diverse Atlanta offense in their own house. Smith had two hurries from just two pass-rushes on the blitz, but also made three tackles for either a short or no gain, and was the victim of illegal blocks twice from the Falcons offense trying to combat his effectiveness in the box. Elite Stat: Eric Weddle caught as many passes (one) as he allowed receivers to catch when targeted. Eric Weddle’s interception was one of the big plays in the game against the Lions, but he also had a sack on the blitz, forcing a fumble on that play and had another almost interception on a play in which he failed to get both feet in for it to count. Weddle was at the heart of the biggest plays on defense for Baltimore. Elite Stat: Jahleel Addae allowed three catches from seven targets. Jahleel Addae tied for the team lead with five solo tackles, adding an assist and a hurry from his two pass-rushes on the blitz for the Chargers against the Browns this week. He also broke up a pass down the seam to TE David Njoku, and had two more pass breakups and one more play of close coverage to prevent a completion on a corner route. The Ravens are starting to click as we hit December, and kicker Justin Tucker was money on Sunday in the win over the Lions, connecting on all three field goal attempts, including one from 50-plus yards. Bosher was outstanding for the Falcons in Sunday’s loss to the Vikings, with two of his four punts landing inside the opposing 20-yard line. Averaging 49.3 yards per punt, and 46.8 net yards per punt, Bosher also saw one of his punts produce 5.33 seconds of hang time. Grant might not have found the end zone this week, but he delivered several dynamic returns for the Dolphins and saw yards wiped out due to penalties. He forced three missed tackles on punt returns in the win over the Broncos. Burton had two tackles on special teams in the loss to the Seahawks, but also impressed with his blocking of a pair of kickoffs.